I am pleased to announce the launch of a brand new monthly beer podcast, The Beertalkers. Each episode, beer sommelier, Sophie Atherton, and I will be chatting about a different topic, interviewing special guests and tasting some beers. The pilot episode of the show asks the question, Is beer posh? A bit of an odd question but prompted by the rise of expensive and exclusive beers and their place in the beer world. We have an interview with Roger Ryman, head brewer of St Austell Brewery where we really get to crux of the question and we taste two beers which are posh for quite different reasons. So give us a listen and please let us know what you think. The one was a bit of a surprise - IKEA are now selling their own beer. We spotted these bottles on our last visit and decided we had to give them a go, especially at the bargain price of £1.75 each. 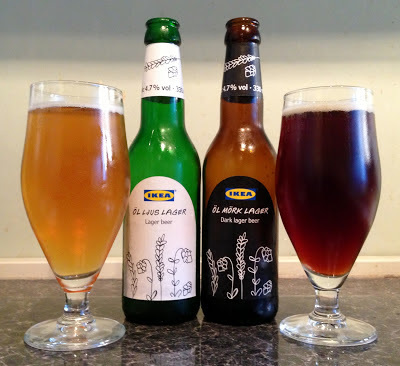 Ikea beers, not quite flat pack. The Öl Ljus (Lager) pours nicely, but as feared was light struck - this wasn't immediately obvious on the nose, but was very pronounced on the taste. If they are able to put the dark lager in a brown bottle why oh why didn't they do it for the blond lager. It is obviously designed to taste like a bog standard lager, and achieves this very well with a dull flavour but lively carbonation. The Öl Mörk (Dark Lager) is a bit better. It pours (and looks) like a porter with a thin head. It doesn't reveal much on the nose, but to taste it is far sweeter, with cola flavours, some hoppy bitterness and slight notes of roasted coffee. All in all a fair effort. It was interesting to try both of these, but the consensus on both was they weren't much to write home about, and we don't think we'd buy them again. We'll stick to the hotdogs in future! Old Manchester one year on. A year ago I bunked off work, jumped on a bus to Chiswick and bought three bottles of Old Manchester, a collaboration beer between Marble and John Keeling, head brewer at Fullers. You can read what I thought about it then as well as an interesting interaction with a friend regarding drinking vessels. I said then that I would taste the other two bottles after one and two years. So now, a year on from that original post, I'm opening the second bottle of Old Manchester. And you know what? I think it tastes exactly the same as it did a year ago. I was expecting some development in the malt or hop character but no. It still tastes fresh with impressive power from the British hops and a rich sweet toffee. It's a little medicinal in a good way and maybe this fleeting flavour is a sign of development through age. So I've decided to leave it another two years before opening the third bottle. I'm want some more dried fruit, some nutty sherry and much more of that herbally medicine flavour. Check back in here in a couple of years to see if my wishes are granted. This is an unusual beer. A wheat beer from Spain brewed by a multi award winning modernist Chef. For over twenty years Ferran Adria forged a brand new form of cuisine in his restaurant, El Bulli. When you've won best restaurant in the world five years in a row and inspired a whole generation of chefs what else is there to do? Well it turns out that the next thing to do is get together with the brewery, Estrella Damm and attempt to brew the perfect beer to go with food. To beer lovers this could be seen as quite patronising. We all know that most beer styles are excellent with food. We don't need a fancy pants chef to brew a special dining beer do we? It's only fair to give the beer a chance to impress, so we got a few bottles in for Christmas. It's a wheat beer brewed with orange peel, coriander and liquorice. You'll notice when you pour a glass that it has the head, aroma and taste of a Belgian wheat beer. It smells like a wheaty peach tea and has a pleasant enough lingering lemony tang in the finish. It's not a knock your socks off beer but easy drinking for every day refreshment. Which kind of goes against its overblown marketing which claims this is an extra special beer for sommeliers to advise for food. You can get Estrella Damm Inedit in supermarkets and other beer retailers. It goes without saying that one quality that's vital in a brewer is a passion for beer. And the beers brewed by the most passionate brewers seem to have an extra spark and burst of flavour. Combine this love of beer with a celebration of your local football team's league promotion and isn't the result is bound to be something special? When Cantillon brewer Jean Van Roy's local team, Royale Union St Gilloise, won the Division 3 title in 2004, he celebrated by brewing this phenomenal dry-hopped, bottle conditioned lambic. It was so good that he has released a version of it every year since. Cuvee Saint-Gilloise proudly wearing its team colours. Unlike a gueuze which is a blend of three years worth of lambic, this is a pure two year old lambic which has fresh styrian goldings added to the cask for its last few weeks before bottling. Just like a gueuze the lemon sourness shoots up your nose and surprises your tongue as you take that first sip. I loved the woody flavours from its barrel ageing but I was expecting the hops to come through more strongly. But wait a bit longer and the bitterness sneaks up on you from behind the wall of sourness making this not only refreshing but also a very satisfying beer. Cantillon are one of our favourite Belgian breweries because of their playful experimentation with these classic styles. However we've tasted a couple of less than perfect beers from them recently. 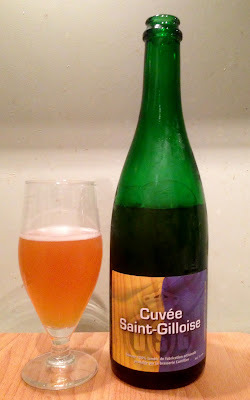 I'm very pleased to be so impressed with this excellent variation on the lambic theme. If you hurry you might still be able to buy this beer from www.beermerchants.com. It really is worth it.